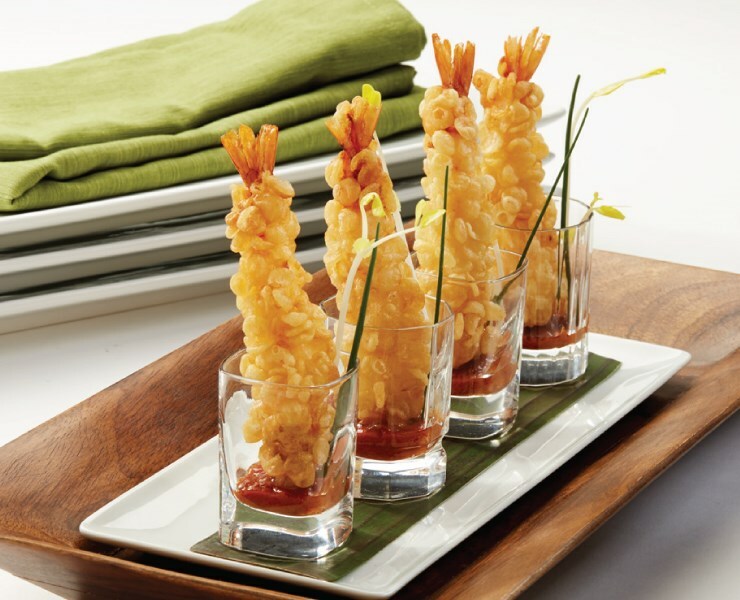 A stretched 26/30ct shrimp, dipped in a traditional tempura batter, dusted in rice crisps. Fry at 170 - 175°C (340 - 350°F) for 5 minutes or longer until shrimp tempura becomes brown. Or, from frozen bake in a Pre-Heated 375ºF Convection Oven for 8 - 10 minutes or longer until shrimp tempura becomes brown. A classic Asian dim sum, tempura shrimp are used in a variety of applications, ranging from: passed hors d’oeuvre / dim sum, sushi, and noodle salad accents. Kabobs’ K0906 Tempura Crisp Shrimp is crafted with a traditional light tempura batter, then rolled in rice crisps, providing a unique, crunchy bite finish. Its mild batter pairs well with any Asian-style sauce (i.e. BBQ Hoison, Ponzu, Sweet Thai Chili).